• greater transparency about the number and nature of Code complaints. “Local government impacts the lives of citizens every day, providing front-line services to those it serves. Its decisions directly affect the quality of life of local people. 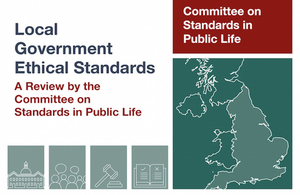 High standards of conduct in local government are needed to demonstrate that those decisions are taken in the public interest and to maintain the public’s confidence. “We believe that the benefits of devolved arrangements should be retained, but that more robust safeguards are needed to strengthen a locally determined system. We are also clear that all local authorities need to develop and maintain an organisational culture which is supportive of high ethical standards. A system which is solely punitive is not desirable or effective; but, in an environment with limited external regulation, councils need the appropriate mechanisms in place to address problems when they arise. “Our recommendations would enable councillors to be held to account effectively and would enhance the fairness and transparency of the standards process. Introducing a power of suspension and a model code of conduct will enable councillors to be held to account for the most serious or repeated breaches and support officers to address such behaviour, including in parish councils. Strengthening the role of the Independent Person and introducing a right of appeal for suspended councillors will enhance the impartiality and fairness of the process, which is vital to ensure that councillors are protected from malicious or unfounded complaints. And greater transparency on how complaints are assessed and decided in a system which is currently too reliant on internal political party discipline will provide a safeguard against opaque decision-making and provide reassurance to the public.